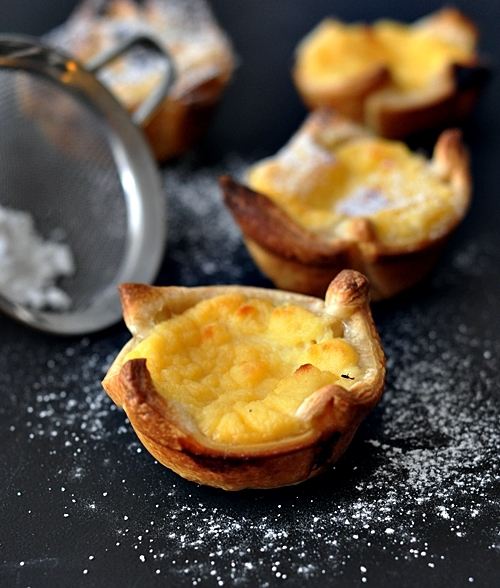 You may find my version of the egg tarts didn’t really look like the ones you see in the Chinese restaurants. Well, these are the Portugese version…and they seemed a little more on the rustic side. But hey, they are super fuss free to make! Don’t worry about rolling or using a cookie cutter make the tart shell consistent. 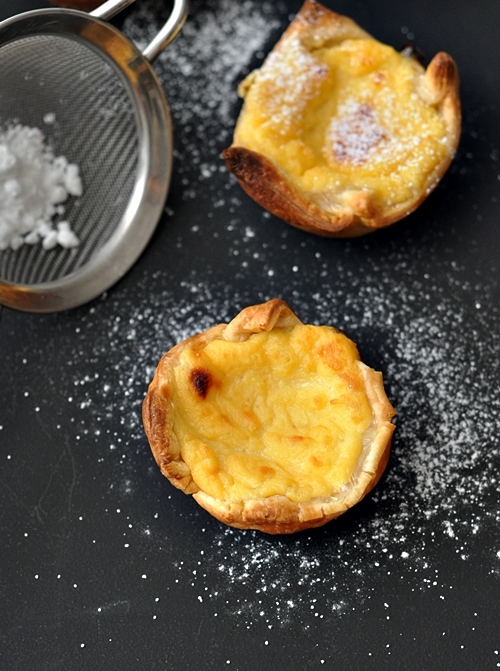 The egg custard is super easy to make. No heavy cream is necessary, thanks to the recipe I discovered from NotQuiteNigella. 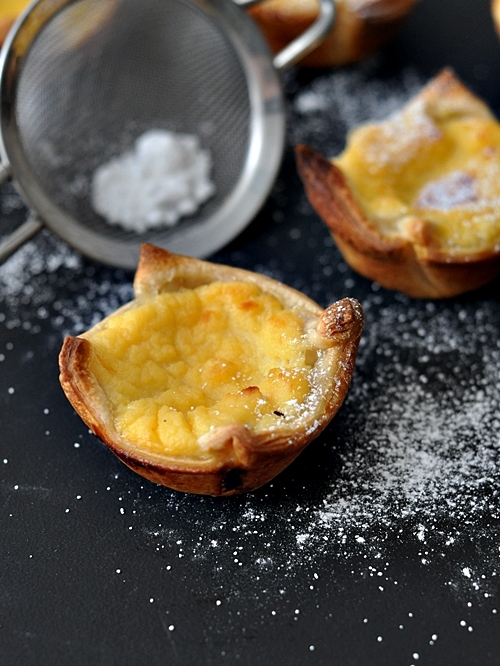 This recipe is a keeper if you want a quick fix for egg tarts. Preheat oven to 200 degrees C/ 392 degres Fahrenheit. Light grease cupcake pan with some cooking oil, set aside. Take out a sheet of frozen puff pasty and leave it to thaw. In a small pot, mix together egg yolks, egg, cornflour and sugar using a whisk. Don’t worry if the mixture seems a little lumpy as they will dissolve when the heat is applied. Over the lowest possible heat setting, keep stirring the egg mixture until smooth.Then gradually add the milk and keep stirring at the same time (the process is similar to making bechamel sauce). Once the mixture is smooth you can pour the remaining milk and wait till the mixture to thicken, keep stirring throughout the thickening process though. For first timers, I would recommend you to do it over low-medium heat until the mixture begins to thicken and foam. Then switch to the lowest heat setting and keep stirring until it changes from a thick cream consistency to the custard consistency (when the mixture can holds it shape on the spoon – soft peak whipping cream). Set aside the egg custard to cool. In the meantime, slice the puff pastry sheet into 9 squares. 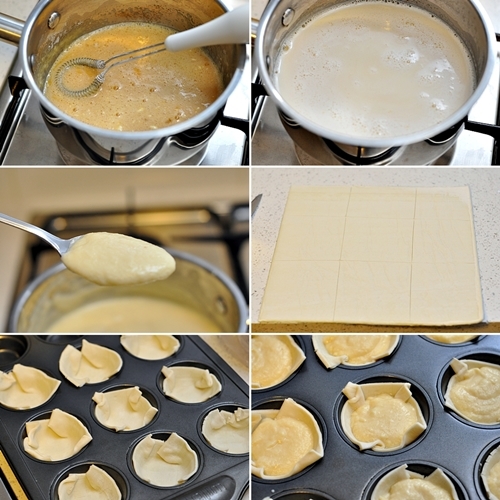 Transfer one square to the cupcake pan to form a tart shell – do the same for the 8 remaining squares. Then use a spoon to scoop the egg custard to fill the shell. Bake in the oven for 20-25 minutes until the filling is slight brown. Leave them to cool in pan for 5 minutes and transfer to a plate. Best serve warm. And congrats to Natalie Stoute for winning the $100 Groupon voucher giveaway! I will send an email to confirm the email address before emailing through the voucher. 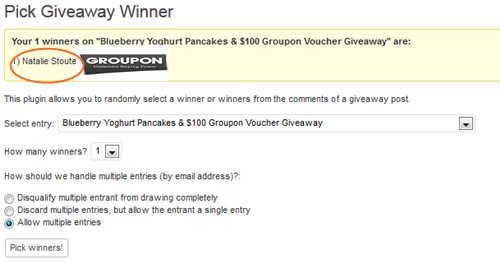 A big thank you to Groupon Australia for such a wonderful treat! 🙂 Don’t forget to check out the Groupon site for daily discounts and deals!